The Taming of the Shrew: the controversial comedy about the battle of the sexes and a very unconventional marriage, starring Fenella Fielding as Katherine, with Miriam Margolyes as Bianca and Paul Daneman as Petruchio. A Midsummer Night's Dream: one of Shakespeare's best-loved plays, this tale of warring fairies, eloping lovers and the magic and madness of love has bewitched audiences since its very first performance. Starring Nigel Hawthorne as Oberon, with Maureen O'Brien as Titania. Twelfth Night: mistaken identity and a tangled love triangle lead to confusion and, ultimately, happiness in this comic masterpiece. Starring Dorothy Tutin as Viola, with Geraldine McEwan as Olivia and Stephen Murray as Malvolio. 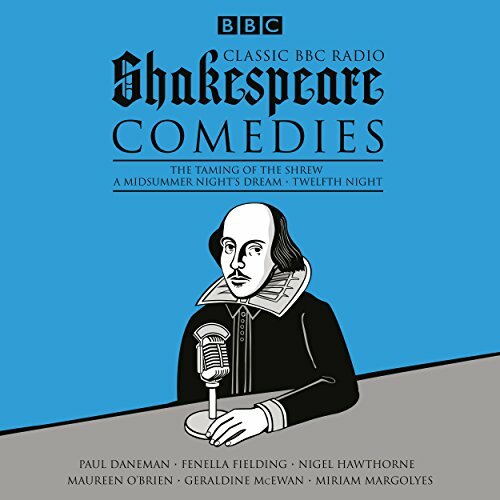 Recorded at BBC Broadcasting House and featuring the BBC Drama Repertory company, with specially composed music including a score from the BBC Radiophonic Workshop, this is classic radio drama at its finest. This is not the full text. It is only partial text. I'm super disappointed about that. This is a terrific little collection to own, and one can only wish that more plays were included within it. I consider it a credit well spent, and will likely listen many more times. My only quibbles with the productions were relatively minor. This rendition of A Midsummer Night's Dream is weirdly uneven, with Helena, for example, seeming even more bipolar-disordered than her character normally suggests; she sounds horribly depressed one moment and positively manic the next. And I'd love a chance to ask the director what he was thinking when he chose to cast Puck as a wildly hip Jamaican/Rastafarian (which would have been an inspired touch in a production with multiple other nontraditional elements), while directing the remainder of the cast to play it straight/traditional. This Taming of the Shrew is a decent production, but misses several interesting opportunities that exist within the play for throwing the theme of misogyny into question. And although this production of Twelfth Night is so good it will make you laugh out loud at the antic schemes of Sir Toby and Andrew Aguecheek while getting chills and being moved to tears by the denouement when long-lost siblings are reunited, it also misses many opportunities, most notably in having the love that Antonio bears for Sebastian remain stubbornly platonic and manly--even overtly macho--almost as if in deliberate denial of the gender-queer implications inherent in the text. Notwithstanding that omission (and the unfortunately disastrously off-key rendering of what is customarily a movingly lovely final song which closes the play), it is Twelfth Night which constitutes the stand-out production among these three plays. It reminded me of one of the finest productions I've ever seen anywhere, at the Oregon Shakespeare Festival in Ashland, Oregon, with the incomparable Dan Donohue as Sir Andrew and the rest of the cast nearly as stellar. Enjoy!